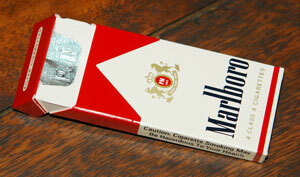 Click Here for web printable Marlboro Cigarettes from C-Ration Accessory Pack. Original was from a formerly unopened original accessory pack. Photos of dissected original pack & other info is included in the pdf file. Click Here for web printable Draft Form. Scan of original thanks to Dave Stieghan. Click Here for web printable Vietnam Boarding Pass. Scan of original thanks to Dave Stieghan. Click Here for web printable DD345 Liberty pass. Scan of original thanks to Dave Stieghan. 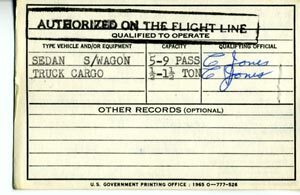 Click Here for web printable DD714 with Vietnam stamp. Scan of original thanks to Dave Stieghan. 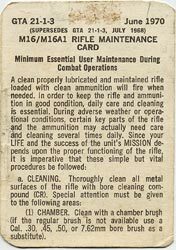 Click HERE for web printable GTA 21-1-3 Rifle Maintenance Card. 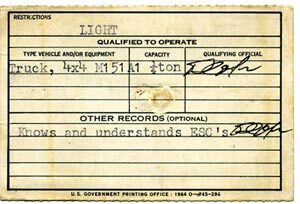 The original of this form was stapled to the cover of a 1977 M16A1 Operator's Manual that I own. 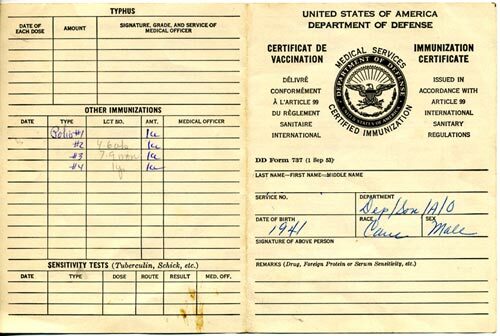 This would be a great item for units to issue to new recruits, and for veterans to carry in the field. 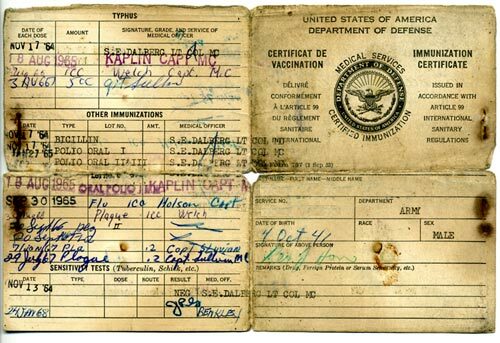 Click Here for web printable Military Driver's License. I have included one with "VIET NAM" stamp, and one without the stamp. Click Here for web printable DA FORM 1155, 1 Jun 66, Witness Statement on Individual. From an original in my collection. 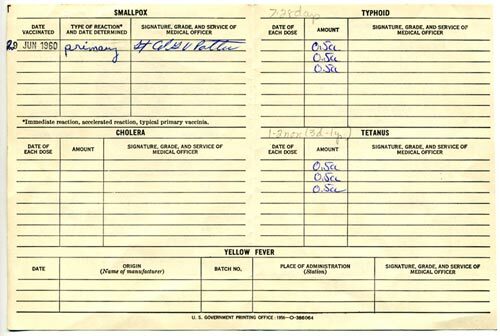 Click Here for web printable DA FORM 1156, 1 Jun 66, Casualty Feeder Report. From an original in my collection. Click Here for web printable DA3078. Scan of original thanks to Dave Stieghan. 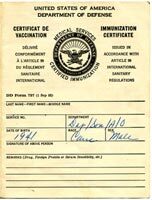 Click Here for web printable Immunization Record. 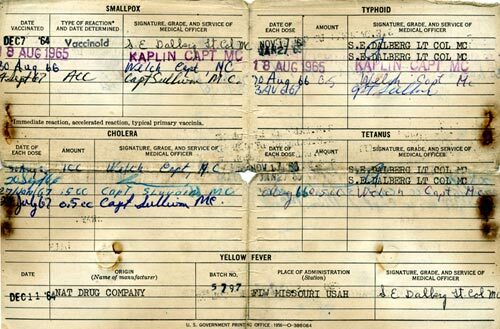 You can also click the links below to see examples of how these were filled out. 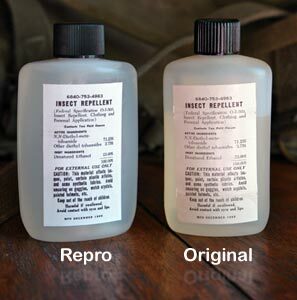 On the right, you will see a photo of the reproduction bug juice next to an original 1966 dated bottle of bug juice. The bottle came from REI. Just visit their site & search for either "jungle juice" or item # 738782 Unfortunately, they've recently raised the price on the jungle juice from $3.95 to $5.50 but I think it's still cheaper than an original bottle of Insect Repellent...and this way you don't have to worry about losing or damaging your original bottle.